Angela Shori is a wife, mother, best-selling author and marketer living and writing in Austin, Texas. By day, she is a Creative Director charged with shepherding a team of copywriters to create unique campaigns for some of the world’s top brands. As a reader, her tastes are very eclectic, and that comes out in her writing as well. She has written and published a historical romance, marketing texts, short stories and most recently a children’s book. If your kids are anything like mine, they’ve been planning for Halloween for weeks – a whole year actually in the case of my oldest who saw a Wicked Witch decoration while trick-or-treating last year and became fascinated with L. Frank Baum’s tale of the Wizard of Oz. She’s going to be our little Dorothy. Llama Llama Trick or Treat by Anna Dewdney – What holiday is complete without our favorite little Llama and his friends. This is a sweet book (we have the board version) that my girls love to look at and “read” themselves. Curious George goes to a Costume Party by Margaret & H.A. Rey – When our favorite monkey goes to a costume party there are fun and scary surprises all around. Is that a ghost?!??! Sofia the First Halloween Ball – This is a very sweet story, and I love the message it sends my girls about being there for each other. I’m not always a huge fan of Princess Amber, but she does provide many little teaching moments and this story is no different. Pete the Cat: Five Little Pumpkins by James Dean – When Pete the Cat’s involved there’s always fun. 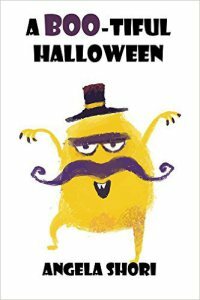 Need more great Halloween reads for the kids? Amazon has a list of the Top 100. Let us know if you find something amazing! Angela Shori is a participant in the Amazon Services LLC Associates Program, an affiliate advertising program designed to provide a means for sites to earn advertising fees by advertising and linking to amazon.com. We’re marking off the days over here with increasing excitement, and I just found out that the kids are reverting to their pre-Oktoberfest plan to be characters from the Wizard of Oz instead of wearing their drindl’s again. Eek! Whatever they end up as, they’ll be super cute, and we’ll have a lot of fun. I’ve seen some really great marketing recently that’s all themed up for Halloween. Such fun. I love this snicker’s ad featuring the headless horseman – or is the the horseless headsman? 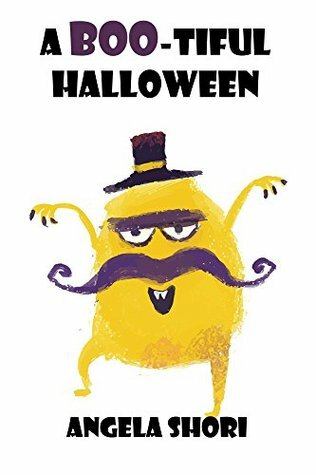 And for a little shameless self-promotion, the monsters of A Boo-tiful Halloween are roaming free again on Amazon Kindle. If you haven’t grabbed your copy, take advantage of it before the 28th. If you love it, please leave a review. Thanks to Don for this wonderful review. I’m so glad you liked it. Please check out Don’s blog for more wonderful book reviews. 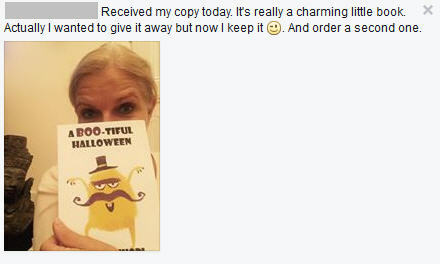 A Boo-tiful Halloween by Angela Shori is the perfect book for night-time, tuck-em-in, reading aloud time. And, of course, it’s perfect for Halloween, which is right around the corner. I can remember reading colorfully illustrated books like this to my son when he was little and he still talks about them, and what fun we had. He would memorize them and finish each rhyme before I could even get it out of my mouth! This book is just like that — one that is perfect for banishing fears of monsters under the bed. In this book, all the monsters are cute and adorable..Five stars to the author for creating a memorable read. Thanks to Allie for this wonderful review. I’m so glad her Mason enjoyed the book so much. Gather all your ghouls and goblins for a colorful journey with the friendly monsters of A Boo-tiful Halloween. This Book doesn’t have a lot of words but that’s not always a bad thing for littles. The illustration’s are usually what matter most with the toddler crowd. The illustrations in this book were a big hit with Mr Mason. He loved the monsters. It’s a great little fun book for the kiddos. Mason give this book 5 stars. I love seeing this kind of thing! Writing a children’s book has always been a dream of mine, and last week that dream came to fruition. What started as a fun little exercise with my girls is now a full-fledged picture book available in print and ebook formats. It’s been a hit here in my house (although I’d admit my kids are probably biased), but the reviews on Amazon have been great too, and it peaked at #10 in its category last week making it an Amazon Best Seller. Not bad for the first time out. The audio book is coming soon (I hope!). This is the first of many titles with my next one already in the hopper. If you’d like to stay up-to-date on new releases, events, or free book promotions, please join my email list. This weekend, after much internal debate, my husband and I took our two girls to Seaworld. It wasn’t my first visit to Seaworld. I remember the awe and wonder I felt watching the orcas and dolphins interact with their trainers when I was a child. I even wanted to be a Marine Biologist for a while. Looking at the park through the eyes of an adult, I felt a profound sadness for the animals housed there. It’s clear that their trainers love them. It’s clear that they get a steady diet. It’s clear that they live their lives in a tiny little fishbowl of a tank when most of them would wander the oceans deep. I saw the 2013 documentary Blackfish. I cried for Dawn Brancheau and for Tilikum. I vowed not to set foot in the park. Then a Groupon came along. Half price. I thought now or never. The park lured us in with Sesame Street characters and the fact that we live in close proximity to it and not to it’s superior Disney counterparts. We rode the scant rides. We saw the impressive shows. We had fun. And yet, my husband and I both left feeling sad. Sad for the animals who are now being bred into captivity and have never known the open ocean. Sad for the animals who were “collected” – a sanitized word for what must have been a brutal and traumatizing event for a young animal torn away from its pod. Sad for the animals who have been trained to clown, to collect the cheap laugh and their allotment of frozen fish. Sad for the trainers who are surely just as much actors in this tragedy – playing the role of marine biologists and psychologists when Seaworld’s website states a college degree is not required to handle these apex predators. There is much we have to learn from these beautiful and intelligent creatures, but, I don’t think we’ll learn them in Shamu stadium anytime soon. I’m not sure what the solution is. Animals bred into captivity certainly wouldn’t fare well in the wild. Free Willy’s Keiko is a prime example of that. These are big whales (orcas). Why do you keep them in such a small tank when they need to be in a big ocean? The trainer, I’m sure having answered many such questions, didn’t skip a beat. She happily spoke of orcas in the wild having to swim many miles to find food and these orcas having the equivalent of breakfast in bed each day. I don’t know about you, but after about two days of that situation, I’m stir crazy. It’s probably an accurate assessment. Visiting Seaworld with my children 30 years after I first watched a trainer dive from Shamu’s nose was indeed an eye-opening experience. It has strengthened my resolve to raise children who are aware of our impact on the world around us. In that, I suppose Seaworld was successful, but it will be our last trip. Perhaps some day we will have the opportunity to see these magnificent creatures in their natural habitat.